It’s time for another Recipe Redux challenge! This month, we had the option of participating in a contest sponsored by The Pistachio Health Institute. Since pistachios are one of my favorite nuts, I jumped at the chance! This wasn’t your typical recipe contest…it was actually a pairings challenge. We were tasked with coming up with a winning combination of food and drink that would pair well with in-shell pistachios. Let’s talk about in-shell pistachios for a minute, shall we? They’re a great healthy snack option, especially for people who like to snack in volume. A one-ounce serving of pistachios equals approximately 49 nuts, which is more nuts per serving than any other snack nut, and a reduced serving of about 30 pistachios is just about 100 calories. In addition, empty pistachio shells may serve as a “visual cue” of how many pistachios you’ve consumed, so don’t discard the shells after you’ve enjoyed the treat inside. Studies have shown that people who left the shells on their desk reduced their calorie consumption by 18 percent compared to participants who discarded shells immediately after consumption. In-Shell Pistachios + Craisins + Cheddar Crackers + Milk = YUM! 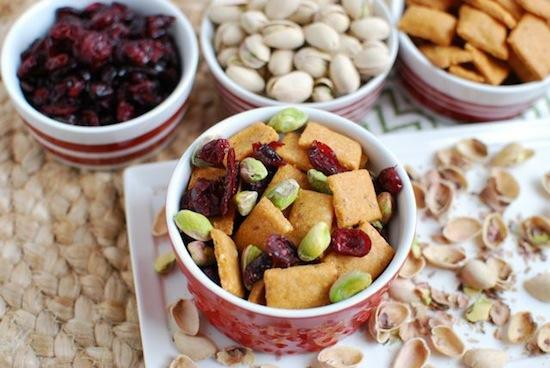 It’s basically like deconstructed trailmix, just waiting to be assembled…which is perfect for kids! I took things to the next level and made my own cheddar crackers and I’ll be sharing that recipe with you tomorrow, but store bought Annie’s Cheddar bunnies or Cheez-Its would work great as well! If your kiddo has a different favorite dried fruit, simply swap out the Craisins to make them happy. AND if you’re looking for a more adult version, swap the milk for wine and add some spice to your crackers. 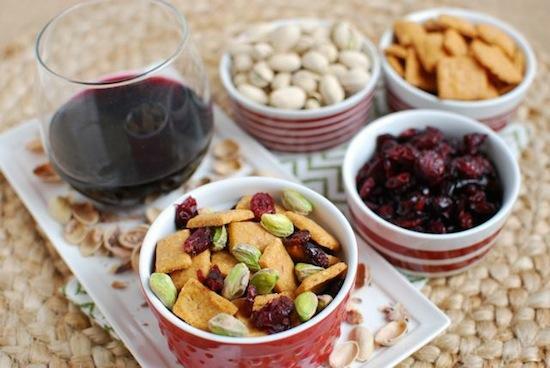 You’ll be left with a wonderful combination of salty nuts, sweet fruit & savory/spicy crackers that pair wonderfully with red wine! Now it’s your turn! What would you pair with your pistachios? I don’t actually like pistachios so I have no brilliant ideas but my husband just loves them so I can’t wait to see some of the ideas I can borrow from everyone to make a little surprise snack for him! this does look really good!! i love pistachios! that sounds like a winning combo to me! Yum!!! That looks pretty and tasty! Not sure what my favorite thing to pair with pistachios is, but I am definitely going to check out some of the other pairing suggestions. I hope you win! Pistachios are delicious! I had some just this morning in a bowl of oatmeal. All I know is pistachios paired with cranberries is the best thing ever. Especially on top of a goat cheese salad with blueberry dressing. To die for. You made those cheese its! Wow! They look wonderful Lindsay! I love the idea of them with dried berries and pistachios, great flavor combination there! I have a big jar of mixed nuts that I consume for snacks between meals, I always pick the pistachios out first as they are one of my favorites….along with macadamia nuts! Yum! Thanks for all the new ideas! Is it bad that I had not tried a pistachio until about a year ago? Silly me!! I had majorly been missing out in the past :(. Yummy! I love all the different options! I love pairing something citrus with my pistachios. They can be so dry sometimes and a little citrus and sweetness makes them pop! Maybe an orange chicken pistachios dish! Hmm.. might try that for dinner tonight! This is a yummy big-kid pairing, too – yum! Thanks for the post! What a quick and easy snack. I wouldn’t have thought to put craisins with pistachios. And I enjoy both! It’s on my grocery list today now. Thanks! Ooo! Pistachios are my favorite nut. 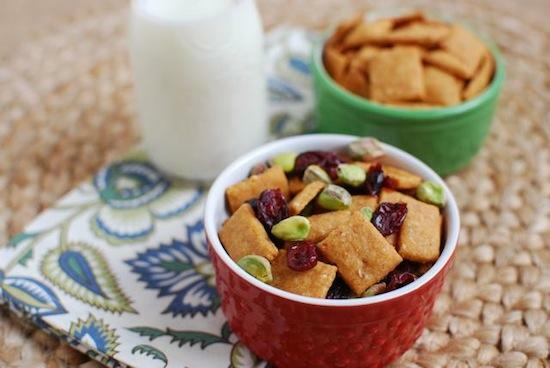 The trail mix with cheddar crackers and craisins is such a fabulous idea! I’ve never had pistachios before, but I’m definitely inspired to try them with this trail mix you created! Oh my gosh I LOVE cheddar crackers! Never would have thought to pair them with pistachios. This would be a great snack for the week 🙂 Can’t wait for the homemade cheddar cracker recipe too! This looks great! I am loving all the options everyone is coming up with! WHAAAT! This Trail Mix looks seriously awesome and the fact that you made your own cheddar crackers is phenomenal. I have been known to stay away from Cheez-its because I LOVE them too much. Can’t wait for the recipe! Bravo! This is fun! I love your ideas…far more creative than me! My kids would def eat this and that’s saying something! So many great pairing ideas! I could pair almost anything up with wine…is that bad? But, hey, a glass a night is ok, right??? Ha! Great idea! I’ve got to get in on that Recipe Redux. Love pistachios! My kids would love!! I can’t wait to see the cracker recipe. I’ve made an awesome pesto with pistachios and sage before! We love pistachios! And pairing them with craisins is seriously the best!! I recently made a quinoa dish that called for them and it was delish 🙂 Can’t wait to try the homemade Cheez-Its, too!